Whilst re-roofing a property in the Coln Valley this superb attic room was discovered. Untouched for a great many years, time had taken its toll. With new rafters and windows and a good deal of hard work this forgotten room is now a versatile asset. Click here for the Velux product range. The natural stone roof has always been a feature of the Cotswolds. The array of sizes and colours make this roofing material a superb cover for any stone building. 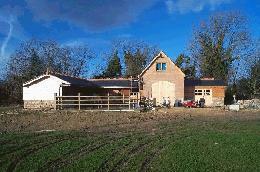 This new stable block and feed store is constructed using natural stone, timber cladding, all under a welsh slate roof. To provide light and easy vision, powder coated alloy half glazed partition sections were used in this project. The effect has produced a bright and secure environment for all within.Get your kids to click here.